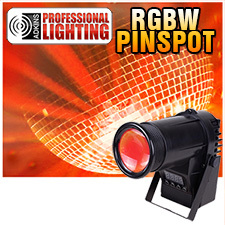 This LED Pinspot is a 10-Watt Quad Color (4-IN-1) Pinspot with red, green, blue and white diodes on one LED. It produces sharp 15-degree beams of light, and is designed to spot Mirror Balls, tables, decor, architecture or used for special effects. It features built in shows, color fades, dimming, strobe and sound activation. This LED Quad color pinspot can be operated by a DMX controller or set to operate in automatic or sound activated mode without a controller. Menus can be accessed via the digital led display on the back of the unit. Adkins Professional Lighting - Quality products at affordable prices! 7.5" x 6.3" x 5.25"